At Chiyawala, there is no Wi-Fi and there are no mirrors. The instruction is to talk to each other and stop validating our beauty externally. Time doesn’t go from January to December or from noon to midnight. You know we all just make it that way in our heads.”—Raffi, Collateral beauty “We do make it in our heads,” says Ganesh Dev Pandey, the founder of Chiyawala, a tea spot that does not have a clock or Wi-Fi. Pandey wants his customers to enjoy the moment on hand, instead of making every experience a passing thing. He now knows to add a lot of ginger, one cardamom pod and absolutely skip the sugar for the tea of my choice, which now is my personal ‘mero khusi chiya’. It’s different for everyone, like some who prefer adding ghee to theirs. That’s what Chiyawala is—a place to share tea with a twist. As Indian classical music softly plays in the background, Ganesh stands in a small kitchen juggling stoves as orders flood in. Behind him is a menu board with around 30 items on it, a few of which still look alien. He enjoys it every time someone stands in front of the counter, lost in the menu, asking questions like why their bestseller is called the ‘Ghanshyam chiya’ or what ‘magic buns’ are. The 39-year-old, who you’ll find cheerful most of the time, has drawn from his own experiences to set up the menu. His mother roasted buns in ghee and curd for him and his siblings when they returned from school. Now, whenever a customer orders the magic bun, he tries to recreate that childhood magic. His father—Ghanshyam, who inspired the bestselling Ghanshyam chiya—was himself a successful tea seller from Butwal. The Ghanshyam chiya is a replica of the popular tea his father sold back when he was a child. With cafés and eateries mushrooming in the Capital, every outlet has tried to come up with something unique to offer its customers. Chiyawala’s 80 sq metre property at Minbhawan is no different. There are plenty of recycled and reused objects for serving implements and decorations. Ganesh has put up his own old television and mini-cycles as tables. A log stands in the centre of the café as a decorative piece. Ganesh bought this log from a butcher shop, as it was about to be thrown away. A tiny Buddha statue sits above the log as a message that peace always prevails over violence. The walls are a vista of yellow and blue, painted with lively pictures of real life people. These people, a few of whom Ganesh himself captured in the photographs, later turned into paintings. 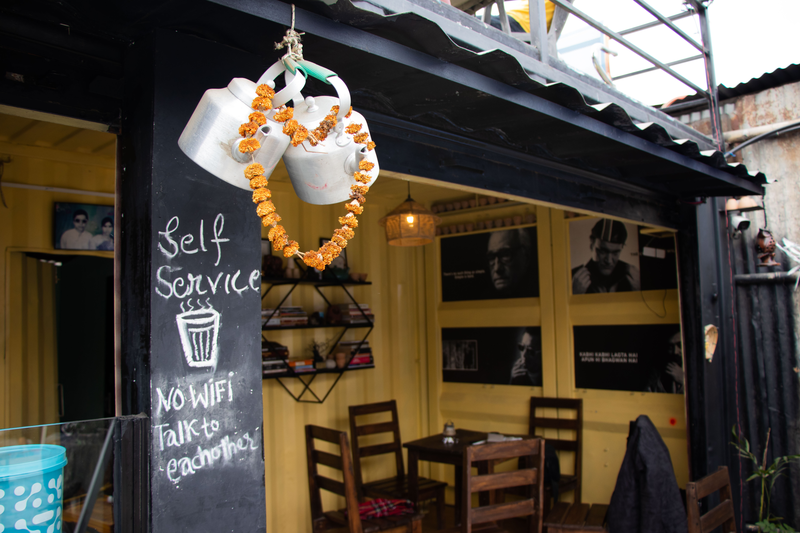 To the left of the kitchen is a built-in container with a range of tea leaves in glass jars while on the opposite side are pictures and quotes from filmmakers—Tarantino, Scorsese and Wong Kar-wai—all of whom Ganesh, a profound film enthusiast, worships. Ganesh remembers the name of most of his customers and maybe it is the bond that he shares with each customer that has been helping him multiply the footfall at his outlet every day. In only four months since opening, Ganesh is already expanding the tea joint to accommodate an additional 30 customers, raising the capacity to 70 at a time. A humble man, he insists on having started without much expectation; the increasing influx overwhelms him sometimes. Chiyawala is always swarming with people at any given evening. Customers come from all walks of life—there are college-going students, corporate officers, filmmakers and actors, all consumed in conversation and tea. A quote at the tea station clearly illustrates that we do not need Wi-Fi all the time. There are no mirrors either. While his close friends, and regular customers, tease him that this is because he does not want to hire people to clean the mirrors every day, Ganesh feels we do not need mirrors to validate our beauty. Tea is in our culture. It has been a staple for the majority of Nepalis for decades now. But who knew there could be 30 different ways to have the same milk tea? As a tea enthusiast, during the early hours, when there’s a smaller crowd, Ganesh can be found twisting the ingredients to add to his already-myriad menu. And sometimes, enjoying his favourite Ghanshyam chiya on his own. Chiyawala has tea for taste buds, for health, and for endless conversations.